2004-03-01 First worldwide family litigation filed litigation Critical https://patents.darts-ip.com/?family=25645140&utm_source=google_patent&utm_medium=platform_link&utm_campaign=public_patent_search&patent=EP0900403(B1) "Global patent litigation dataset” by Darts-ip is licensed under a Creative Commons Attribution 4.0 International License. The present invention relates to sunglass lenses, in particular sunglass lenses with refractive power. It is known in the prior art to manufacture non-corrective eyeglasses such as sunglasses or protective eyeglasses having wrap-around segments designed to shield the eye from incident light, wind, and foreign objects in the temporal vision field of the wearer. Goggles of this type are disclosed in EP 0446698 (Bezazel Research & Development). Corrective wrap-around spectacles are known from GB 680 400. Visible light and light in the UV region may enter the eye from angles as high as 100° from the line of sight. It has not been possible, however, in prior art sunglasses or protective eyeglasses to provide spectacle lenses with refractive power. The radii of curvature required to provide an ophthalmic lens defining a prescription zone is such that the spectacles would produce a bug-eyed appearance, which would be cosmetically unacceptable. Whilst attempts have been made in the prior art to provide a wrap-around sun shield over otherwise generally standard prescription eyeglasses, such products are generally cosmetically unacceptable and suffer from significant optical distortions. It is accordingly an object of the present invention to overcome, or at least alleviate, one or more of the difficulties and deficiencies related to the prior art. wherein the front and/or back surface includes an aspheric component having non circular main sections selected to at least partially adjust for off-axis astigmatic and mean power errors. The rotation of the lens produces a number of optical effects and errors, as discussed below. However, by suitable selection of the combination of front and/or back surfaces, the optical errors may be reduced or eliminated. There is an induced astigmatic error such that the astigmatism, a, is proportional to the power of the lens, P, and proportional to the square of the rotation angle of the lens. When the lens is used in a wrap-around form the mean through power of the lens changes. The mean power error, dP, is proportional to the astigmatic error, a, and proportional to a constant, k, that is related to the index of the lens. Hence in a minus Rx the mean power becomes more negative and in a plus Rx the mean power becomes more positive. Due to the rotation of the lens and the oblique angle of the optical axis, lens prism is introduced. Off-axis prismatic disparity will result from unequal distortions in the temporal and nasal fields, resulting in poor binocular vision. The lens element described may result in increased off-axis power and astigmatic errors due to the selection of a base (front) curve that is designed to fit standard wrap frames, rather than for best optical performance. These errors may result in un-accommodatable power errors. The front and/or back surface curvature may be adjusted to account for the change in mean power resulting from rotation of the lens, the degree of correction depending upon a balance of wearer tolerable on-axis power error and reduction of un-accommodatable off-axis power errors. Hence a full power correction for the introduced shift in through power to correct on-axis errors may be applied or a partial correction when off-axis power error is considered. The front and/or back surface may at least in part be toric in nature to correct for astigmatic error resulting from the lens rotation discussed earlier. The degree of correction may fully correct for the astigmatism introduced due to rotation of the lens or may be partially corrected depending upon the application. A partial correction may be applied to achieve a tolerable on-axis astigmatic error so as to reduce the off-axis astigmatic errors. The optical centre may be shifted horizontally to compensate for prism induced by the lens rotation. This may be achieved by applying prescribed prism during surfacing or shifting of the tens element in a horizontal direction. 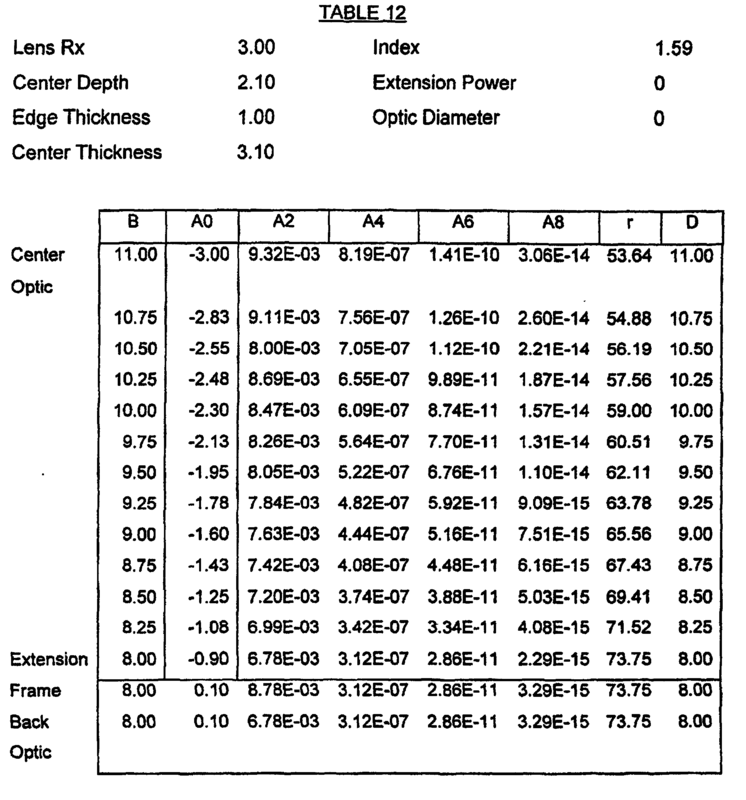 These corrections include, but are not limited to, pantoscopic lens tilt, variation in lens frame types, cosmetic requirements and average pupil-centre to lens distances depending on frame and lens form types. To correct for off-axis prismatic disparity the lens may include an aspheric surface on either the front or back surfaces, or both. Aspherisation of either the front or back surfaces may be utilised to correct for off-axis errors including errors introduced due to tilt and/or the selection of the base curves. Such off-axis error may include power and astigmatic error and prismatic disparity. It will be understood, however, that whilst it is relatively simple to correct for any particular optical error, it is necessary to balance the correction to achieve acceptable overall performance of the lens. 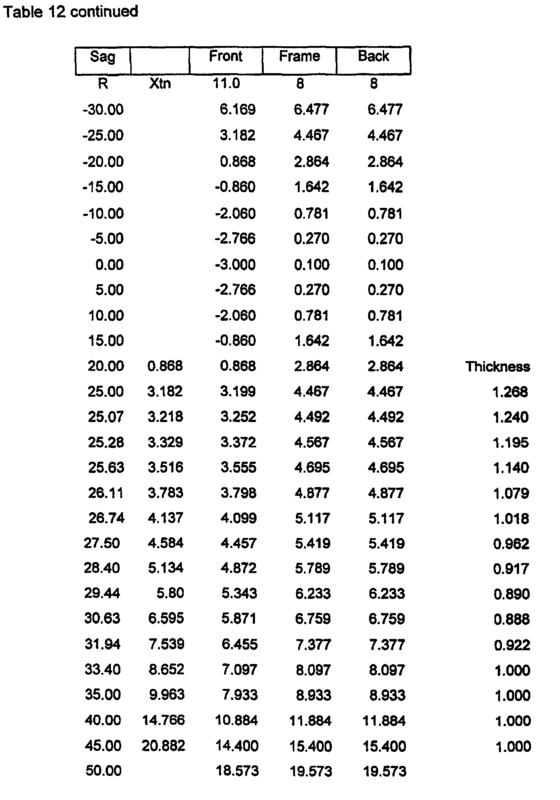 Illustrative error corrections which may be undertaken for a typical rotation of approximately 20° about the vertical axis, for a range of plus (+) and (-) lens elements of varying power, are given in the following Table. 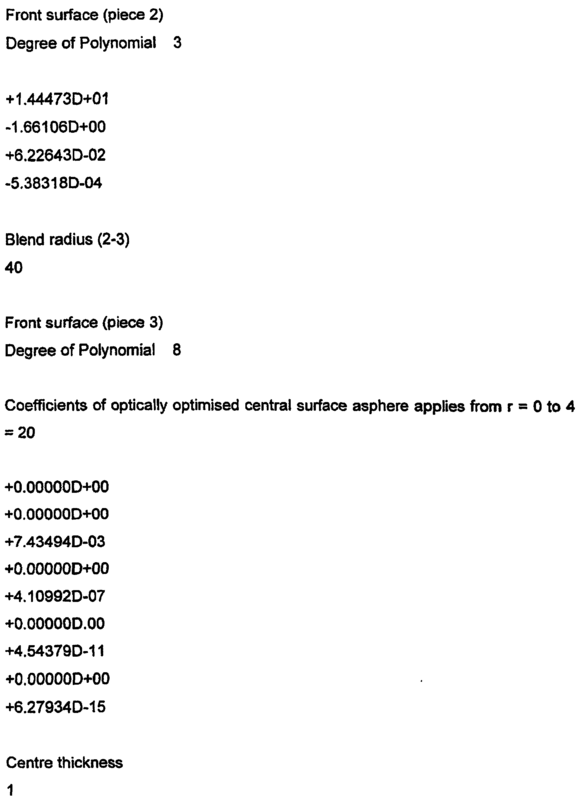 It is to be noted that the eyeside surface power corrections given assume that the above errors are fully corrected to recover the sphere Rx specified at the optical centre. Lesser corrections may be undertaken, if required, to achieve acceptable overall performance of the lens. It is preferred that the front and/or back surface includes a toric component and is designed to at least partially adjust for on-axis astigmatic and mean power errors. Such on-axis errors may result from the rotation of the lens when mounted in a wrap-around or shield type frame. Further, the front surface may be an aspheric surface that includes appropriate aspheric coefficients to define the peripheral temporal zone. The aspheric front surface may exhibit line symmetry about the horizontal and/or vertical geometric axis thereof. Further, the aspheric coefficients defining the peripheral temporal zone may exhibit line symmetry about a horizontal and/or vertical line intersecting the optical axis and/or line of direct sight, in use, thereof. It is further preferred for the aspheric surface corrections to be in the horizontal direction. The lens element may also include a correction to avoid prismatic jump. Preferably, the lens provides correct Rx correction in the prescription (Rx) zone for a wearer in directions not greater than 50° off axis, in use, relative to the optical axis. It is further preferred for the lens to provide a desired Rx correction in the prescription (Rx) zone for a wearer extending beyond 50° off axis and terminating in the peripheral temporal zone, that provides clear perception of objects in the peripheral area of human vision and avoids prismatic jump from the prescription zone to the peripheral temporal zone. In a preferred form, the back surface includes a base curvature such that the patient's required prescription power, Rx, in the prescription zone is achieved; the back surface being further modified to complement the front surface selected. It is further preferred for the back surface to include a toric or spherical component selected to achieve the prescribed optical power and lens cylinder correction. The back surface may further include an astigmatic error correction to compensate for errors induced by rotation about the vertical axis. Preferably, the surface is an aspheric toric surface and includes an adjustment to correct for on-axis astigmatic and/or mean power errors. In a further preferred form, the front surface is aspheric and includes a base curvature appropriate for high base curve lenses above 6.0 D and appropriate aspheric coefficients to define the peripheral temporal zone, and the back surface is of appropriate curvature to provide the prescribed optical lens power and prescribed lens cylinder and including adjustments for astigmatic and mean power error correction to compensate for errors induced by rotation about the vertical axis. Preferably, the back surface of the lens element includes a toric or spherical component. In a further preferred form, the front surface of the lens element includes a spherical or toric component designed to provide the desired prescription correction (Rx) in the prescription zone, and bearing a surface correction to at least partially adjust for errors including astigmatic and mean power errors, in combination with the back surface, and including appropriate coefficients to define the peripheral temporal zone; and a transition section therebetween designed such that prismatic jump between the prescription zone and peripheral temporal zone is avoided, and the back surface is modified to complement the front surface. The lens element may be modified to permit light control within the peripheral temporal zone. The reflected colour of a sunglass lens is primarily a function of the dyes at the front surface of the lens. A mirror coating may be applied to the back surface of the lens so that the combination of front and back surface reflections achieves specular intensity (mirror) and the sense of lens colour (tint). Alternatively, or in addition a different tint coating or layer may be provided at the rear surface of the lens. This may alter both the intensity and spectral character of transmitted and reflected rays interacting with the over-tinted region of the lens. In a further option, the front or rear surface (preferably the rear) may be frosted so that reflected and transmitted light is diffuse. That is, images are not formed by light which enters the lens. The frosted part of the lens is visually opaque (translucent) to a wearer. To someone else, the lens will reflect the tinted colour from its front surface against a dull shadow from the frosted part of the rear surface. Preferably the rear surface may include a localised mirror coating from which the reflection is a matte finish. The mirror coating may be introduced utilising conventional techniques. for example vacuum deposition of metal film on a finished lens. A chemical solution of a pristine metallic layer may be deposited on part of a casting mould and subsequently a lens is cast against that mould. A metal mirror thus formed may transmit insufficient light to form any troublesome images and reflecting a soft matte finish in copper, nickel or whatever the chosen metal. Liquid Crystal Film: for example polymeric sheet 0.20 mm thick changing colour across the full spectrum with changing temperature. The ophthalmic lens may be formulated from any suitable material. A polymeric material may be used. The polymeric material may be of any suitable type. The polymeric material may include a thermoplastic or thermoset material. A material of the diallyl glycol carbonate type may be used. The polymeric article may be formed from cross-linkable polymeric casting compositions, for example as described in applicants United States Patent 4,912,155, United States Patent Application No. 07/781,392, Australian Patent Applications 50581/93 and 50582/93, and European Patent Specification 453159A2, the entire disclosures of which are incorporated herein by reference. Such cross-linkable polymeric casting compositions may include a diacrylate or dimethacrylate monomer (such as polyoxyalkylene glycol diacrylate or dimethacrylate or a bisphenol fluorene diacrylate or dimethacrylate) and a polymerisable comonomer, e.g. methacrylates, acrylates, vinyls, vinyl ethers, allyls, aromatic olefins, ethers, polythiols and the like. For example, in Australian Patent Application 81216/87, the entire disclosure of which is incorporated herein by reference, applicant describes a cross-linkable coating composition including at least polyoxyalkylene glycol diacrylate or dimethacrylate and at least one poly functional unsaturated crosslinking agent. Further, in Australian Patent Application 75160/91, the entire disclosure of which is incorporated herein by reference, applicant describes a polyoxyalkylene glycol diacrylate or dimethacrylate; a monomer including a recurring unit derived from at least one radical-polymerisable bisphenol monomer capable of forming a homopolymer having a high refractive index of more than 1.55; and a urethane monomer having 2 to 6 terminal groups selected from a group comprising acrylic and methacrylic groups. Such polymeric formulations are UV cured or cured by a combination of UV and thermal treatment. The range of optical lenses sold under the trade designations "Spectralite" by Applicants have been found to be suitable. The polymeric material may include a dye, preferably a photochromic dye, which may, for example, be added to the monomer formulation used to produce the polymeric material. The variation in depth of colour may be minimised by incorporating a pigment or dye into one or more layers of the optical article. The ophthalmic lens element according to the present invention may further include standard additional coatings to the front or back surface including electrochromic coatings. The front lens surface may include an anti-reflective (AR) coating, for example of the type described in United States Patent 5,704,692 to applicants, the entire disclosure of which is incorporated herein by reference. The front lens surface may include an abrasion resistant coating. e.g. of the type described in United States Patent 4,954,591 to applicants, the entire disclosure of which is incorporated herein by reference. In a particularly preferred form, the laminate ophthalmic article may include an inner layer providing desired optical properties of the type described in International Patent Application PCT/AU96/00805 to applicants, the entire disclosure of which is incorporated herein by reference. The front and back surfaces may further include one or more additions conventionally used in casting compositions such as inhibitors, dyes including thermochromic and photochromic dyes, e.g. as described above, polarising agents, UV stabilisers and materials capable of modifying refractive index. In a further preferred form, the high curvature spectacle lens element provides prescription correction in the zone in the range of about -6.0 D to +6.0 D with about 0 to +3 cyl. Preferably, the peripheral temporal zone is a non-prescription zone. In a preferred form, the front surface of the lens element has a high curvature in the horizontal plane extending from nasal to temporal limits above 6.0 D, but the curvature in the vertical plane is 6.0 D or below. Preferably, the shape of the front or back surface in the region between the two zones is developed from a polynomial spline selected to avoid a prismatic jump from the Rx zone to the temporal zone. Preferably, the prescription zone extends beyond 50° off axis relative to the optical axis, when mounted in a frame, in use and terminates in a peripheral temporal zone. The invention also extends to a unitary lens formed from a pair of high curvature lens elements providing prescription correction in the zone in the range of about -6.0 D to +6.0 D with about 0 to +3 cyl, as discussed above. Preferably, the unitary lens provides correct Rx correction in the prescription (Rx) zone for a wearer not greater than 50° off axis, relative to the optical axis when mounted in a frame, in use. It is further preferred for the lens to provide desired Rx correction in the prescription (Rx) zone for a wearer beyond 50° off axis when mounted in a frame in use and terminating in the peripheral temporal zone, that provides clear perception of objects in the peripheral area of human vision and avoids prismatic jump from the prescription zone to the peripheral temporal zone. The prescription zone may extend up to 80° off axis. and wherein the front and/or back surface includes an aspheric component selected to at least partially adjust for off-axis astigmatic or mean power errors. In a preferred form of the laminate spectacle lens, the front lens element is generally plano; and the complementary back lens element includes a lens element of positive or negative power. modifying the representation of the lens surface to at least partially correct for errors induced by said rotation including astigmatic and mean power errors in the prescription zone and prismatic errors. modifying the representation of the back surface of the lens element to at least partially adjust for errors including astigmatic and mean power errors. In a preferred form, the method includes adding to the first mathematical representation a second mathematical or numerical representation of a transition section designed such that the prescription zone and peripheral temporal zone define a complete lens surface. Preferably, the spectacle lens element further includes a nasal accentuating region defined by reduced or opposite curvature of the lens. the front and/or back surface bearing a surface correction to at least partially adjust for errors induced by said rotation including astigmatic and mean power errors in the prescription zone, and a correction to at least partially adjust for prismatic errors. Preferably, the prescription zone extends beyond 50° off axis, relative to the optical axis. the back surface providing good clearance from temples or eye lashes. It is preferred that the frame has a constant design curvature of between 8.0 D and 10.0 D.
Normal representation of the cross-section of a spherical or aspheric lens surface may be via the coordinates SAG = A2R2 + A4R4 + A6R6 + A8R8 where R is the radius measured from the optical axis and A2, A4, A6 and A8 are coefficients that define power and asphericity. It is assumed that the lens is rotationally symmetric about the optical axis. Thus R2 = x2 + z2 where the x axis is normal to the optical axis (y) in the direction towards the temples and the z axis is vertical with respect to a wearer's face. 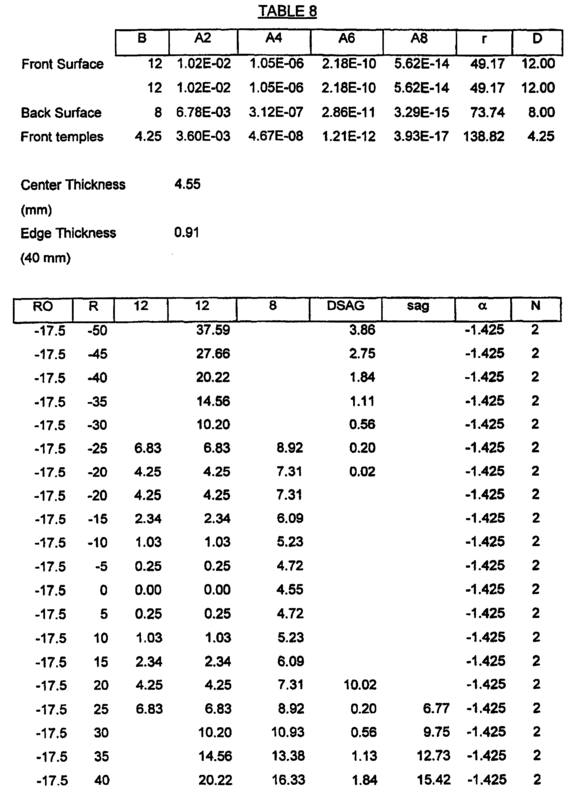 The use of asphericity in conventional lens design is to produce small deviations from spherical form and the components of power are defined by the surface curvatures T = [d2y/dr2] /[1 + (dy/dr)2 ]3/2 tangential S = (dy/dr) / r [1 + (dy/dr)2]1/2 sagittal where the sag is denoted by y. Surface power of the lens is therefore defined by the two derivatives dy/dr = 2A2R + 4A4R3 + 6A6R5 + 8A8R7, and d2y/dr2 = 2A2 + 12A4R2 + 30A6R4 + 56A8R6. It is convenient to set up a torus geometry by regarding the total SAG as that due to the basic lens design curve plus a component "DSAG" which comes from a temporal curvature extending beyond some radius Ro and which is defined by a similar set of coefficients operating on the radial dimension (R-Ro). 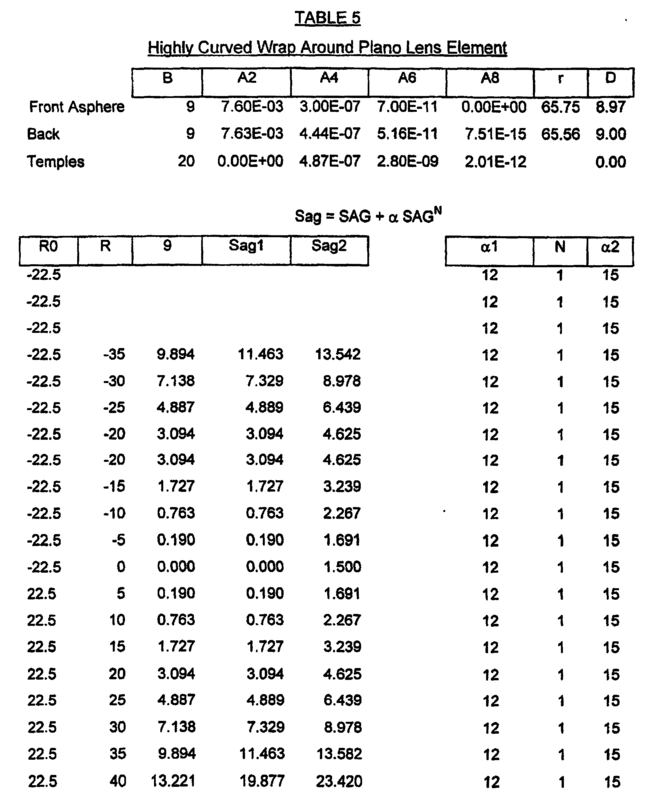 In this case sag = SAG R≤Ro, wherein R is the radius measured from the optical axis and A2, A4, A6 and A8 are coefficients that define power and asphericity. It is assumed that the lens is rotationally symmetric about the optical axis. sag = SAG + DSAG R≥Ro. wherein R0 defines the periphery of the temporal region; and DSAG = B2(R-Ro)2 + B4(R-Ro)4 + B6(R-Ro)6 + B8(R-Ro)8 wherein B2, B4, B6 and B8 are co-efficients that define power and asphericity. The first and second derivatives of sag are then the sums of the individual derivatives dy/dr → dy1/dr)r=R + dy2/dr)r=R-R0, d2y/dr2 → d2y1/dr2)r=R + d2y2/dr2)r=R-R0, where by definition both y and dy/dr are continuous at R=Ro, but the second differential is discontinuous. If we generalise the expressions so that sag = SAG + α(DSAG)N for R≥Ro, where α and N≥1 are numerical parameters, we gain greater freedom to model the surface and gain better control over surface power changes at the onset of toric curvature. The first and second derivatives are continuous at R = Ro if either of the following conditions applies 2 > N ≥ 1 and B2 = O, or N ≥ 2 for all values of B2. Conveniently, we have found a generalised representation that provides continuity of surface curvature in both sagittal and tangential directions. That is, we can model the toric form without discontinuities in surface power. Given such forms, we are able to place one surface behind another of similar generating equation to provide a lens with strong curvatures but without discontinuities in refractive power through the lens. When the curves produced by the above models with N=1 and N=2 are calculated and plotted, it is evident that the torus sheet blends asymptotically to the central optic zone, provided the condition on B2 is observed. The model departs very gradually from the design sphere, blending the optics of the two design zones. It will be understood that the surfaces of a lens element are surfaces of rotation swept by any of the expressions above for sag with respect to a chosen axis of revolution. In the mathematical development above, we have specified rotational symmetry about the optical axis. This generates a lens form with the same mean surface power at horizontal and vertical meridians, having a peripheral temporal zone around the entire perimeter of the lens element. Before such a lens element can be mounted proximate the face in a wrap around frame or shield, the temporal extension is cut away except at the locations corresponding to the temples of the wrap around eyewear. In an alternative embodiment, the appropriate surface alteration may be formed from the SAG curves as defined above by rotating the sag curve about an axis parallel to the x axis within the plane of the horizontal meridian. The curved portions intended to provide the temporal extension of such lenses are then located towards the ends of the horizontal meridian, whilst the vertical curves may retain conventional spherical or aspheric lens form. If the parameters A2n and C2n are set equal, the optic zone has the same surface power in vertical and horizontal meridians. If the parameters C2n correspond to curves of lower power than the A2n parameters specify, the surface power of the optic zone will be lower in the vertical meridian. Lens elements formed in this way assist in achieving conformance of the wrap around eyewear to the face. A high base curve of the order of 8 or 9 Dioptres way be used to wrap laterally to the temples. However a lower curve, for example approximately 2 to 5 Dioptres matches the vertical shape of the face and allows the lenses to be placed closer to the eyes without indenting on the brows or cheeks. 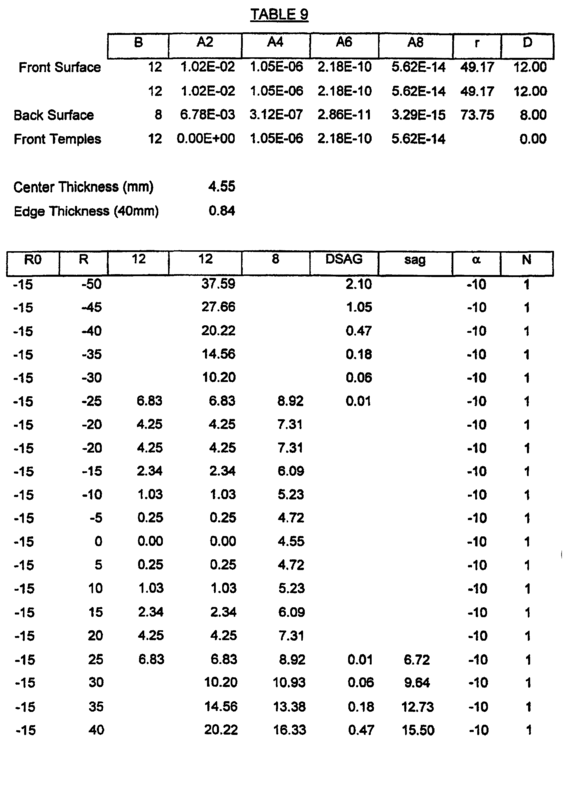 The use of such more conventional base curves to define the vertical meridian also alleviates the need to apply off axis astigmatism and power corrections in this meridian. The present invention will now be more fully described with reference to the accompanying figures and examples. It should be understood, however, that the description following is illustrative only and should not be taken in any way as a restriction on the generality of the invention described above. Figure 1 illustrates light paths through a lens surface bearing a sunglass tint. Figure 2 s a stylised illustration of an ophthalmic lens (right hand lens) of minus Rx power. Figure 3 is a stylised illustration of the peripheral temporal zone of an ophthalmic lens bearing a positive Rx surface. Figure 4 is a stylised side view of an ophthalmic lens bearing a minus Rx surface according to the present invention. Figure 5 is a series of cross-sectional views of front surface laminating wafers for plano, plus, and minus lenses according to the present invention. Each front surface is rotationally symmetric. Figure 6 is a stylised plus and minus back surface wafer for lamination to the front surface wafers illustrated in Figure 5. Cylinder correction may be carried out on the back surfaces. Figure 7(a) is a semi-finished optical blank: finished optical surface (1), unfinished rear surface (1'), axis of rotation symmetry (3), desired optical axis (4). In this example, the blank diameter is 76 mm, the front surface curve is 8 Dioptres and the angle between the axes (3) and (4) is 20°. The thickness of the blank may be 15 mm or so, depending on design needs. Figure 7(b) is a second optical surface (2) rotationally symmetric about the optical axis (4) created on the front of the optical blank by grinding and polishing. The difference in power of (1) and (2) is the final Rx power of the lens. In this example, (2) is 4 Dioptres. Figure 7(c) is a final Rx lens of power -4 Dioptres with a central optical zone of width ±35° around the optical axis (4). Curve (5) is identical dioptric power to (1) centred on axis (4). The temporal limit of the piano skirt (upper part of the drawing) of this lens is 88° from the line of forward sight for a rear vertex distance of 28 mm. Figure 8(a) is a true plano lens of 9 Dioptre base curve. Curves (6) and (7) are both 9 Dioptres centred on the optical axis (4). Note the apparent "base-in" prism of the lens when considered in terms of the displaced geometric axis. The nasal (lower) part of the lens is thicker. Figure 8(b) is a final Rx lens of power -4 Dioptres created by curve (8) of 5 Dioptres centred on the optical axis (4). Figure 9(a) is a true piano lens of 10 Dioptre base curve. Curves (9) and (10) are both 10 Dioptres centred on the optical axis (4). Note the apparent "base-in" prism of the lens when considered in terms of the displaced geometric axis. The nasal (lower) part of the lens is thicker. Figure 9(b) is a final Rx lens of power -4 Dioptres created by curve (11) of 6 Dioptres centred on the optical axis (4). The optic zone width is ±45° for a rear vertex distance of 28 mm, with the temporal limit of the piano skirt of the lens being 95°. Figure 10(a) is a true piano lens of 12 Dioptre base curve. Curves (12) and (13) are both 12 Dioptres centred on the optical axis (4). Note the apparent "base-in" prism of the lens when considered in terms of the displaced geometric axis. The nasal (lower) part of the lens is thicker. Figure 10(b) is a final Rx lens of power -4 Dioptres created from the blank in Figure 7(a); curve (14) is 8 Dioptres centred on the optical axis (4). The optic zone width is ±45° for a rear vertex distance of 28 mm, with the temporal limit of the plano skirt of the lens being 98°. Figure 11(a) is a final Rx lens of power +4 Dioptres produced from the semi-finished blank moulded against a back mould surface of similar form to the front of the lens shown in Figure 7(c): curve (15) is -8.2 Dioptres centred on axis (4) to limit the final lens thickness, curve (16) is 4 Dioptres centred on axis (4). The optic zone is ±35° about the optical axis (4) and the pseudo piano temporal skirt (upper part of drawing) extends 87° from the forward line of sight for a rear vertex distance of 28 mm. Figure 11(b) is a final Rx lens of power +4 Dioptres: curve (17) is 10.2 Dioptres centred on axis (4) to limit the final lens thickness, curve (18) is 6 Dioptres centred on axis (4). The optic zone is ±40° about the optical axis (4) and the pseudo piano temporal skirt (upper part of drawing) extends 95° from the forward line of sight for a rear vertex distance of 28 mm. Figure 12(a) is a schematic illustration of a pair of minus lens elements according to the present invention of -3.0D through power rotated about their vertical optical axes by 20°. Figures 12(b) and (c) show the resulting mean surface power and astigmatism contours after the rotation of the lenses in Figure 12(a). Figures 12(d) and (e) illustrate the resulting mean power and astigmatism contours after subjecting the back surfaces of the lenses of Figure 12(a) to a full correction of the required mean through power. Figures 12(f) and (g) illustrate the resulting mean power and astigmatism contours after subjecting the back surfaces of the lenses of Figure 12(a) to a further full toric back surface correction. Figures 12(h) and (i) illustrate the resulting mean power and astigmatism contours after subjecting the back surfaces of the lenses of Figure 12(a) to a further partial toric back correction. Figures 12(j) and (k) illustrate the resulting mean power and astigmatism contours after subjecting the back surfaces of the lenses of Figure 12(a) to a partial mean power and partial toric back correction. Figure 13(a) is a schematic illustration of a pair of piano lens elements according to the present invention of 3.0D through power rotated about their vertical optical axes by 20°. Figures 13(b) and (c) show the resulting mean surface power and astigmatism contours after the rotation of the lenses in Figure 12(a). Figures 13(d) and (e) illustrate the resulting mean power and astigmatism contours after subjecting the back surfaces of the lenses of Figure 12(a) to a full correction of the required mean through power. Figures 13(f) and (g) illustrate the resulting mean power and astigmatism contours after subjecting the back surfaces of the lenses of Figure 12(a) to a further full toric front surface correction. Figures 13(h) and (i) illustrate the resulting mean power and astigmatism contours after subjecting the back surfaces of the lenses of Figure 12(a) to a further partial toric front correction. Figure 14(a) is a schematic illustration of a pair of aspheric minus lens elements according to the present invention of -3.0D through power rotated about their vertical optical axes by 20°. Figures 14(b) and (c) show the resulting mean surface power and astigmatism contours after subjecting the lens elements to aspherisation of the front surface and a full toric back surface correction. Figures 15 and 16 illustrate a series of laminate optical plus (+) lens elements. Figure 17 illustrates a laminate optical minus (-) lens element. Figure 18 illustrates a laminate or integral surfaced minus lens element wherein the thickness of the laminated assembly is adjusted by selecting back elements of different diameter, thus altering the size of the optical zone of the final lens. Figures 19 and 20 illustrate optical lens elements including a temporal generally piano extension of modified curvature. 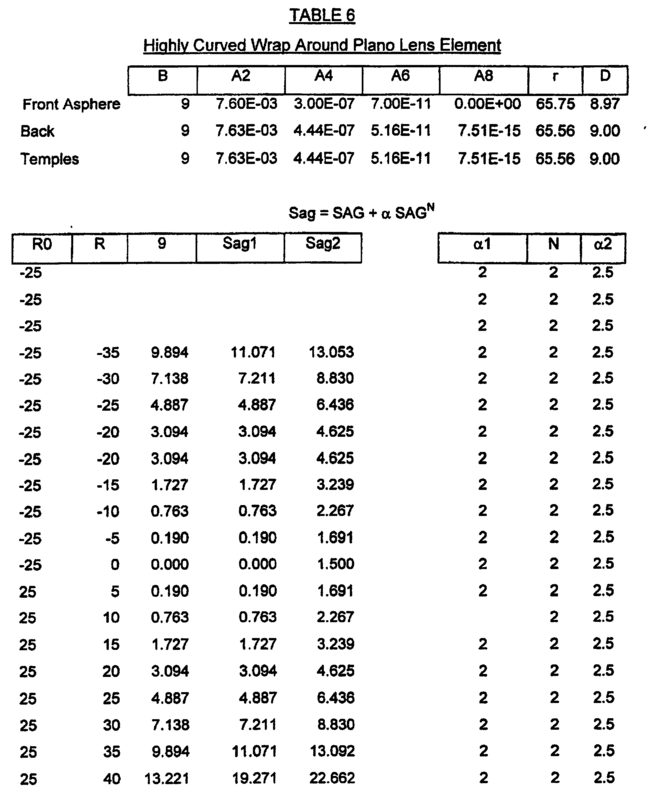 Figures 21 to 29 illustrate plus and minus optical lens elements whose front surfaces are described by the expression sag = SAG R≤ R0, sag = SAG + DSAG R≥R0 and form both an optical zone giving the required Rx correction and a peripheral temporal zone with a simple spherical or toric back surface. Figure 21 shows a plus lens of power +2 Dioptres with a piano temporal extension. Figures 22 and 23 show plus lenses of power +4 Dioptres. That in Figure 22 has a smooth transition of power to a piano temporal extension, being designed with the parameter N = 2. The lens in Figure 23 has a less desirable discontinuity in front surface power, being designed with the parameter N = 1. Figures 24 and 25 show lenses of power -4 Dioptres. That in Figure 24 has a smooth transition of power to a piano temporal extension, being designed with the parameter N = 2. The lens in Figure 25 has a less desirable discontinuity in front surface power, being designed with the parameter N = 1. Figures 26 to 28 illustrate similar plus and minus optical lens elements created by blending two different surfaces of standard conic design but of different powers corresponding to the optic zone and the temporal extension. Like the lens shown in Figure 23, these lenses exhibit discontinuity of either tangential or sagittal curvature at the transition between the two design regions. This requires, in turn, that the surface be optimised, so far as is possible, by standard ray tracing techniques in order to minimise the astigmatism and blur introduced by the transitional region between the optic zone and the temporal extension. Figures 29 and 30 illustrate similar optical plus and minus lens elements including a generally piano temporal extension. These lenses may be produced as stock lenses or provided via semi-finished blanks, as preferred. For a cast stock lens, the back mould will be unaltered from a conventional back mould for example of the Spectralite type. For a semi-finished blank, the rear ophthalmic surface is ground and polished per standard procedure. In both cases, the principal difference is that the front mould will have a periphery curved sharply to the torus design. A side-fill tube gasket would appear appropriate to both product forms. A semi-finished (S/F) blank is used normally to supply a range of scripts from each base curve as well as accommodating different pupillary distances (PD's) and different frame shapes and sizes. For all of these lens styles, a specific frame style may be used, so cut lens shape will not vary in a major way. Nevertheless, the S/F blank has to provide for the defined Rx range, the individual PD and the essential temporal extension curve. This curve is steeper the higher the minus script produced and steeper the larger the radius from optical center to temporal edge (i.e. the smaller the PD, all other factors constant). The geometry of a S/F blank is generally as illustrated in Figure 4. The front torus curve of the blank extends down the outer edge by at least the depth required for the highest recommended minus power for that nominal base curve (including cylinder). It is not constant at all orientations. Each S/F blank is decentred to allow for a normal spread of PD's. The selection of a particular radius on the blank to be the horizontal meridian of the finished lens will define both the operable PD and the true power of the horizontal meridian. Blanks may be provided with ink markings and alignment callipers to allow correct orientation for surface edging. However edging does not remove the desired temporal curvature. A finished spherical power lens series are the exact parallel of the S/F blank sketched above, except that the rear surface are also optically finished. An ophthalmic lens similar to that in Example 1 is produced, except that the geometric and optical centers of the lenses are not offset. Such lenses are used with a frame system that allows the PD to be set via the attachment of the lens to the frame supports, rather than by offsetting the geometric and optical centers of the lenses. Single point turning apparatus for generation of the required surfaces (both spheres and cyls). Alternatively flexible fining and polishing pads may be used to complete the optic zone surface to a good optical finish and a minimal buffing of the rear temporal "ledge" is sufficient. The torus segment of the resultant lens is translucent although free of generating marks. A gradient mirror coating over this area completes the Rx. An ophthalmic lens according to the present invention is laminated from a front and back wafer pair via a conventional lamination system, e.g. the Matrix™ system, United States Patents 5,187,505, 5,149,181 and 5,323,192 to applicants, the entire disclosure if which is incorporated herein by reference. The interface curve in a laminating system needs to have rotational symmetry about the optical axis in order for the cyl axis to be selected according to the script. Accordingly lens wafers are prepared in which the geometric and optical centres of the lenses are not offset. The wafers are approximately 80 mm diameter with conventional optics in central zones of about 55 mm diameter with temporal "torus" edges that are more steeply curved. This is illustrated in Figures 5 and 6. The temporal extension effect is an excess sag of at least 10 to 15 mm. This is the critical feature of the design concept; asymmetric edging of completed lenses creates the geometry aimed to conform to the brow. The nasal side of the edged lens is fully spherical while elsewhere, the excess sag reaches towards the brow around toward the temple. A series of lenses of piano or negative refractive power according to the present invention is produced from a conventional spherical S/F blank of the form shown in Figure 7(a) by first mounting the front (finished) optical surface of the blank on an eccentric tooling fixture so that the axis of revolution for generating and polishing the rear surface of the blank is offset from the nominal axis of the blank by an angle of (say) 20° or so. Next, an optical surface of exactly the same dioptric power as that of the front surface of the blank but centred on the offset axis is produced on the rear (concave) surface of the blank. This results in a true piano lens with separate optical and geometric axes. The form of the piano lens is reminiscent of a lens to which base-in prism has been applied, as the nasal side of the lens is thicker than the temporal side (Figures 8(a), 9(a) and 10(a)). There is strictly no prism applied, only that the plano lens is designed with the same optical precision of any other part of the Rx range. The production of a true plano with properly aligned optical axis is necessary for high base curves for example 9 Dioptres and above, but is generally neglected in lower quality sunglasses. Next, the piano lens is mounted via its rear surface to rotate eccentrically around the defined axis. Then a desired secondary optical surface centred on this optical axis is generated and polished on the front surface. 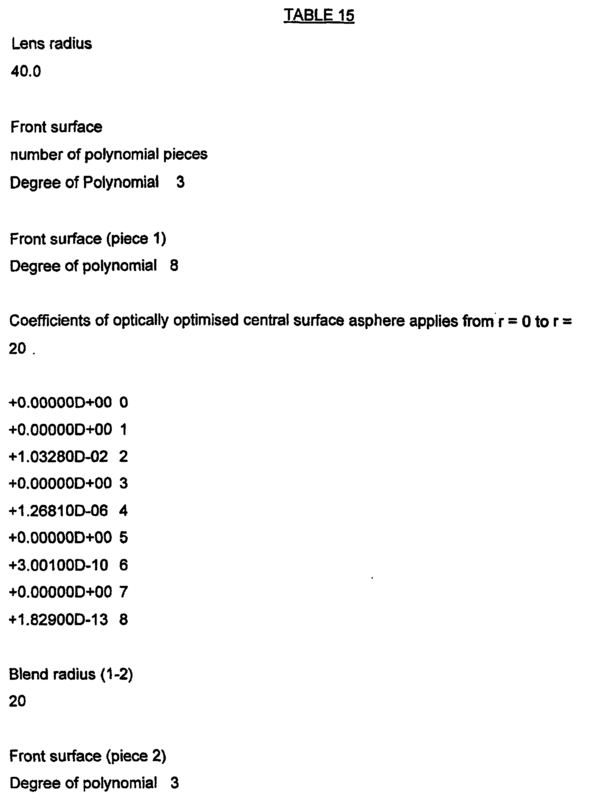 The power difference between this surface and the original surface is the spherical power of the final Rx, with this newly produced optical surface defining the actual optical zone of the powered lens (Figure 7(b) and (c)). The piano portion of the lens surrounding the optical zone provides the temporal extension required for lens according to the invention. This increases as the base curve is increased, shown in Figures 7 through 10 for a -4 Dioptre Rx lens. For the examples in the Figures, the temporal extension increases from 88° to 98° temporal with base curve increasing from 8 to 12 Dioptres. The corresponding optic zone widths range from ±35° to ±45° with increasing base curve. Clearly, the order in which the two optical surfaces are created may be reversed if desired. This is generally the case when it is necessary to apply cylinder to the rear surface for correction of astigmatism. For plus lenses according to the invention, the front optical surface of the S/F blank does not have a second optical surface imposed upon it. Rather, the rear surface has compound form shown in Figure (11) for +4 Dioptre Rx lenses. The compound rear surfaces of these lenses, i.e. 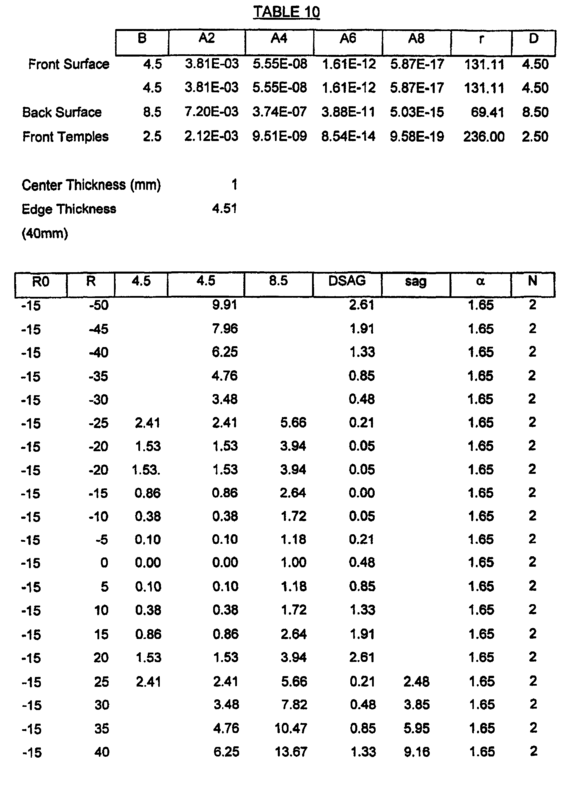 curves (15)+(16), (17)+(18) and (19)+(20), are generated about the optical axis using computer controlled equipment such as a Coburn IQ generator or one of the several precision optical lathes available to the industry and are polished to ophthalmic requirements by polishing with flexible or inflatable polishing pads, as used in the industry. The optic zone is defined by the central optic on the rear surface of the finished lens. Its breadth ranges from ±35° to ±48° as base curve increases from 8 to 12 Dioptres, whilst the temporal reach grows from 87° to 98°. Clearly, the same technology can be used to create minus power lenses maintaining a simple front curve and designing a compound rear surface to suit. It is also understood that all of the surfaces described here can be imparted a cylindrical component (desirably on the rear curves) to correct astigmatism. In order to limit the total thickness of plus lenses, it is desirable to minimise the effect of the apparent base-in prism of the true plano lenses at these high base curves. The rear surface of the temporal extension of the plus lenses is therefore made slightly higher in spherical power than the front curve so that the temporal extension is of approximately constant thickness throughout. As a result, the temporal extension has slight negative power, in the order of 0.25 Dioptres for the highest base curves (about 12 Dioptres). Such refractive power is not noticeable to most wearers and we therefore refer to the temporal extension as "pseudo-plano". All of the lenses described in this example may be produced by casting monomer within moulds shaped to impart the described surface forms after polymerization. In this case, the compound surfaces for both plus and minus Rx lenses are preferably placed at the back of the lens element. Those surfaces are then produced as convex surfaces on the corresponding back mould, facilitating the process of mould manufacture. In such a configuration, plus Rx lenses and minus Rx lenses will have the same front form so that the external appearance of the sunglass will be independent of the prescription of the wearer. Cylinder for the correction of astigmatism may be introduced similarly be appropriately shaped back moulds oriented according to the desired prescription. Alternatively, mild cylinder up to 1.50 Dioptres or so can be imparted by grinding and polishing a secondary curve on the front surface of a lens of the appropriate spherical power. This would suit approximately 95% of cylindrical corrections for most populations. The following is an example that describes a lens element constructed according to the present invention. A lens was constructed with O°C pantoscopic tilt to achieve a prescribed through power of -3.0 D and 0.00 D of cyl using the following curves (see Figure 12(a)). Figures 13(b) and (c) show the resulting mean surface power and astigmatism contours relative to lens surface coordinates. Figures 12(d) and (e) illustrate the resulting mean power and astigmatism contours relative to lens surface coordinates. Figures 12(f) and (g) illustrate the resulting mean power and astigmatism contours relative to lens surface coordinates. Full mean power and partial toric back correction. 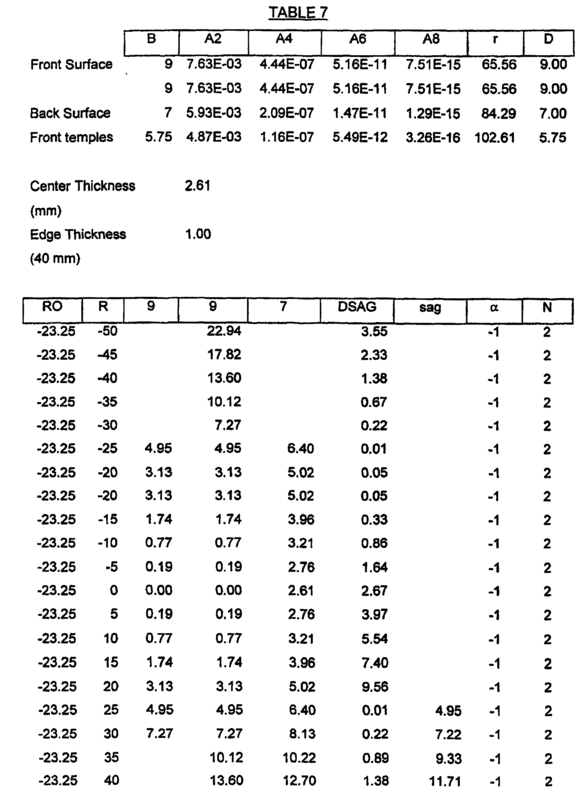 The back surface curve was adjusted to achieve full correction of the required mean through power of -3.00 D. A partial toric back surface correction was applied to balance the off-axis and on-axis astigmatic errors. This gives the following optical results. Figures 12(h) and (i) illustrate the resulting astigmatism contours and mean power contours relative to lens surface coordinates. Partial mean power and partial toric back correction. Figures 12 (j) and (k) illustrate the resulting astigmatism contours and mean power contours relative to lens surface coordinates. The following is an example that describes a lens constructed according to the present invention. Construct a lens with 0°C pantoscopic tilt to achieve a prescribed through power of +3.0 D and 0.00 D of cyl using the following curves (see Figure 13(a)). Rotate the lens in the temporal direction about the vertical optical axis by 20° (see Figure 13(a)). 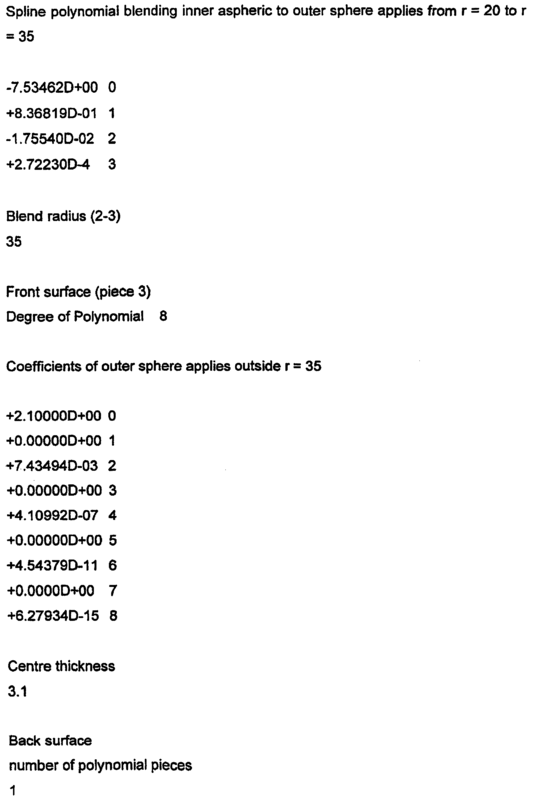 Figures 13(b) and (c) show the resulting mean power and astigmatism contours relative to lens surface coordinates. Figures 13(d) and (e) illustrate the mean power and resulting astigmatism contours relative to lens surface coordinates. Figures 13(f) and (g) illustrate the mean power and resulting astigmatism contours relative to lens surface coordinate. Full mean power and partial toric front correction. Figures 13(h) and (i) illustrate the mean power and resulting astigmatism contours and mean power contours relative to lens surface coordinates. Aspheric front surface and toric back surface corrected (see Figure 14(a)) The back surface was adjusted to achieve full correction of the required mean through power of -3.00 D and also a toric back surface correction was applied to result in a full astigmatic correction in a manner similar to Example 6C above. An aspheric front surface correction was applied to reduce off-axis astigmatic and power errors. Figures 14(b) and (c) illustrate the resulting mean power and astigmatism contours relative to lens surface co-ordinates. An optical lens element including a peripheral temporal zone was formed from a front 9 base aspheric piano element and a number of rear spherical plus lens elements laminated to the rear surface thereof. The surfaces are defined utilising a standard mathematical approach. 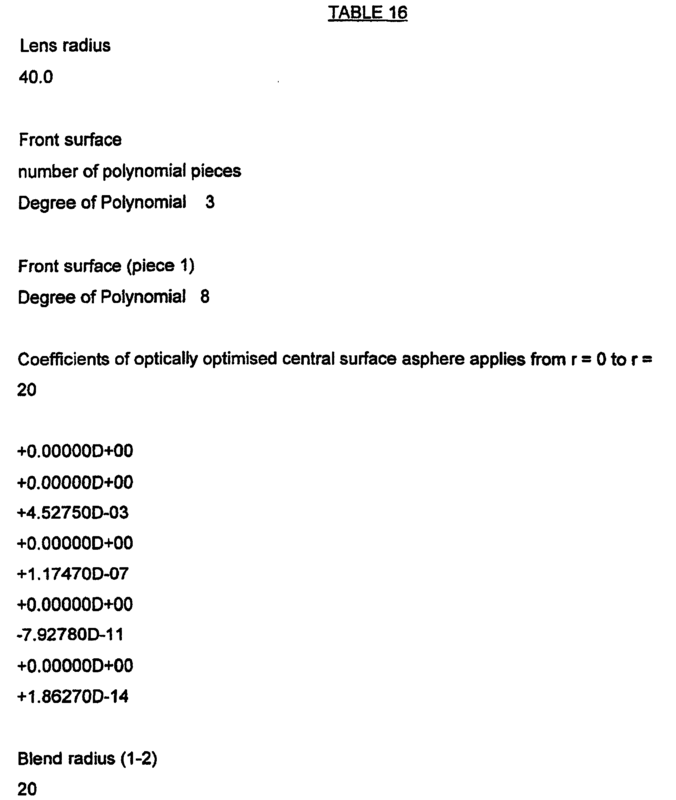 The surfaces have the characteristics specified in Table 1 below. The resulting lens element is illustrated schematically in Figure 15. Example 9 was repeated utilising rear lens elements of the same refractive power (+4 and +6 Dioptres) but of reduced diameter. The optic zone of each is reduced in angular extent, while the overall laminated lenses are substantially thinner. The surfaces are defined utilising a standard mathematical approach. 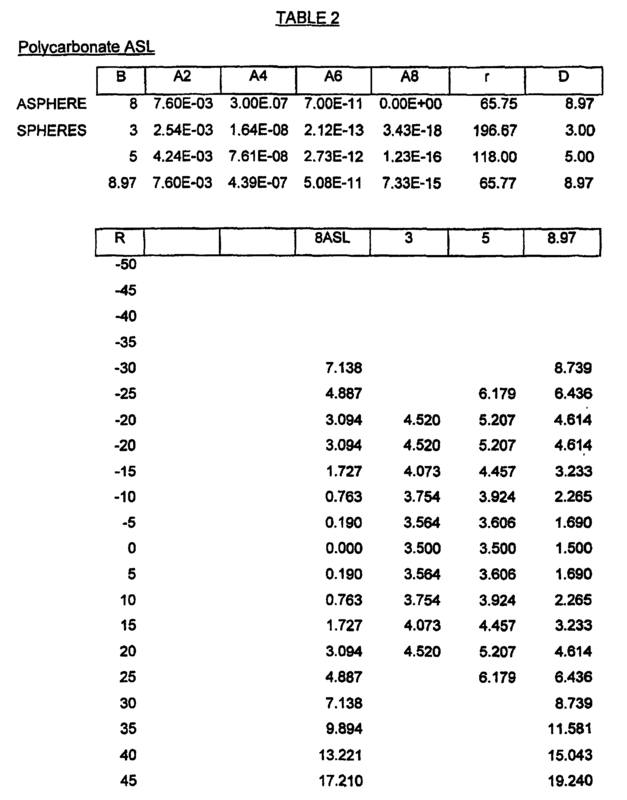 The surfaces have the characteristics specified in Table 2 below. The resulting lens element is illustrated schematically in Figure 16. Example 9 was repeated utilising rear lens elements of -4 and -8 Dioptre refractive power, wherein the edges of these elements were angled parallel to the line of sight at those edges, or more steeply, so that the wearer experiences a sudden change from the optic zone to the piano temple extension without any intermediate optical transition or distortion. The surfaces are defined utilising a standard mathematical approach. The surfaces have the characteristics specified in Table 3 below. The resulting lens element is illustrated schematically in Figure 17. An optical lens element including a peripheral temporal zone was formed from a front 9D base aspheric front surface together a rear -4D and -8D base spherical rear surface. The rear surface may be formed either by lamination as described in example 1 above or may be integrally formed by cutting on an NC mill or on standard optical processing equipment with an additional final polishing step to round off the sharp edge which would otherwise exist at the boundary of the optic zone and the integral temple extension. The surfaces are defined utilising a standard mathematical approach. The surfaces have the characteristics specified in Table 4 below. The resulting lens element is illustrated schematically in Figure 18. An optical lens element is formed utilising a circular front surface and conic rear surfaces with a modified plano temporal extension. The front or rear surfaces may be formed from front and rear lens elements laminated together or may be integrally formed by cutting on an NC mill. The surfaces are defined utilising the modified mathematical formulae described above. The surfaces have the characteristics specified in Table 5 below. The resulting lens element is illustrated schematically in Figure 19. Figure 20 illustrates a similar lens element to that in Figure 19. The surfaces have the characteristics specified in Table 6 below. It is noteworthy that the front piano described in this example has an optic zone and a temporal region of high curvature which together define a plano lens with essentially constant thickness from the central region through and including the temporal extension. This is an alternative and different approach to achieving the piano sunglass or safety glass lens attributes described in United States Patent No. 5,604,547 to Gentex. Example 13 was repeated utilising 9 D design for the front surface of the optic zone and a 7 D circular back surface to define an integral lens element of through power +2 D. The front generating curve for the temporal extension was 4.5 D and resulted in a temporal zone with slight positive refractive power. The surfaces are defined utilising the modified mathematical approach described above with N=2 and a negative value for the parameter α (- 1.2). 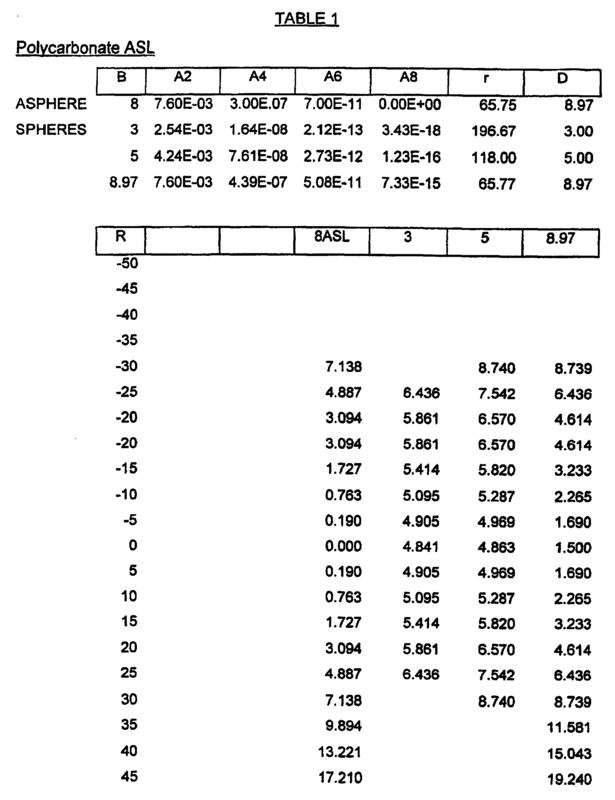 The surfaces have the characteristics specified in Table 7 below. Obviously the lens element may be rotated or decentred to improve cosmetic relationship with a wearer's face without the need to Introduce higher lens curvature. Example 14 was repeated utilising a front surface of 12.00 D for the optic zone and a back surface of 8.00 D to define an integral lens element of +4.00 D through power. 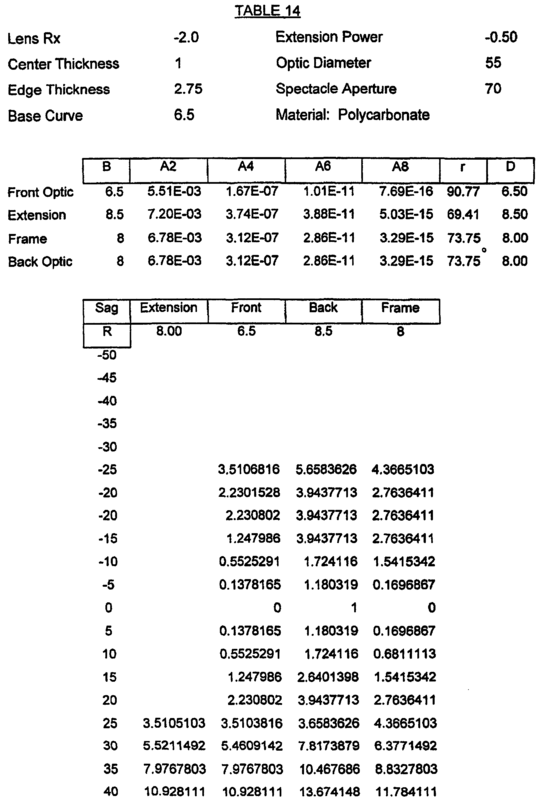 The front generating curve for the temporal extension was 4.25 D.
The resulting lens element is illustrated in Figure 22 and its surface characteristics are specified in Table 8. In this case the temporal extension changes smoothly from the power of the optic zone (+4.00 D) to piano. Example 15 was again repeated utilising a front generating curve for the temporal extension of 12.00 D and setting N=1, rather than N=2 in the previous example of Figure 22. 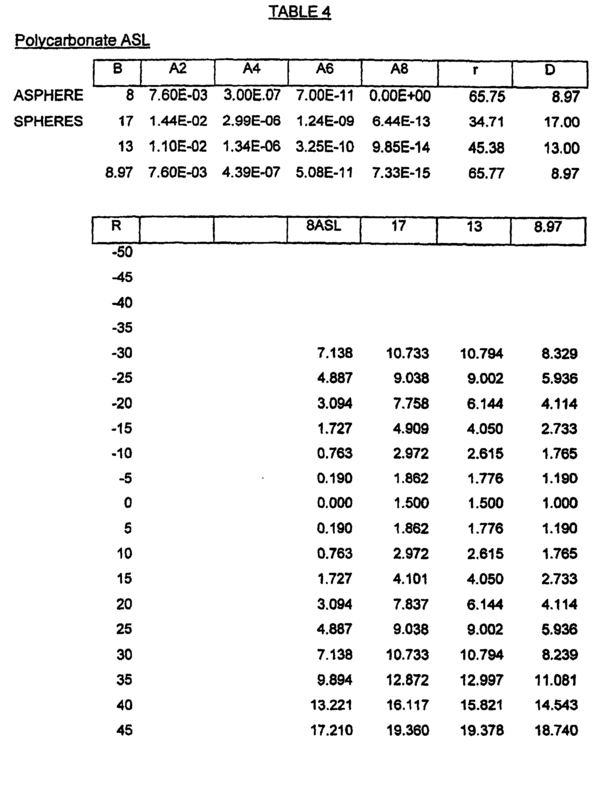 The resulting lens element is illustrated in Figure 23 and its surface characteristics are specified in Table 9. In this case, the temporal extension is piano, the diameter of the optic zone is reduced. Example 14 was repeated utilising a front surface of 4.50 D for the optic zone and a back surface of 8.50 D to define an integral lens element of -4.00 D through power. 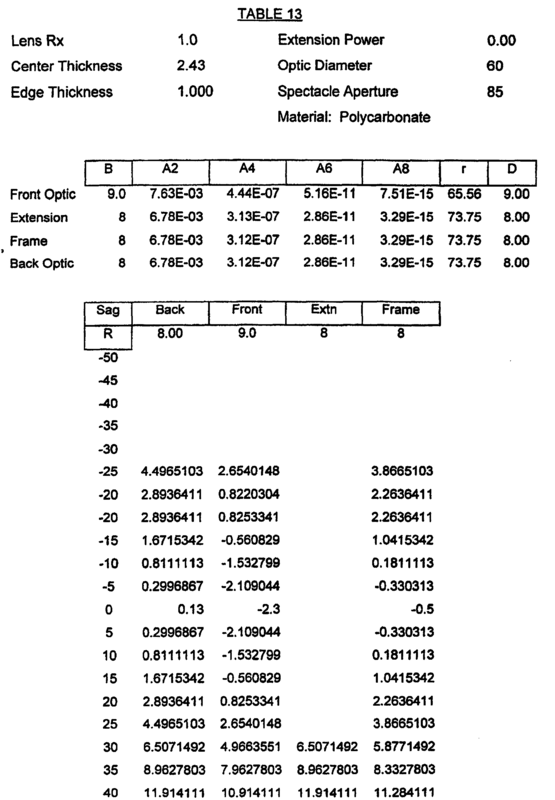 The front generating curve for the temporal extension was 2.50 D.
The resulting lens element is illustrated in Figure 24 and its surface characteristics are specified in Table 10. In this case the temporal extension changes smoothly from the power of the optic zone (-4.00 D) to piano. Example 17 was again repeated utilising a front generating curve for the temporal extension of 11.00 D and setting N=1, rather than N=2 in the previous example of Figure 24. 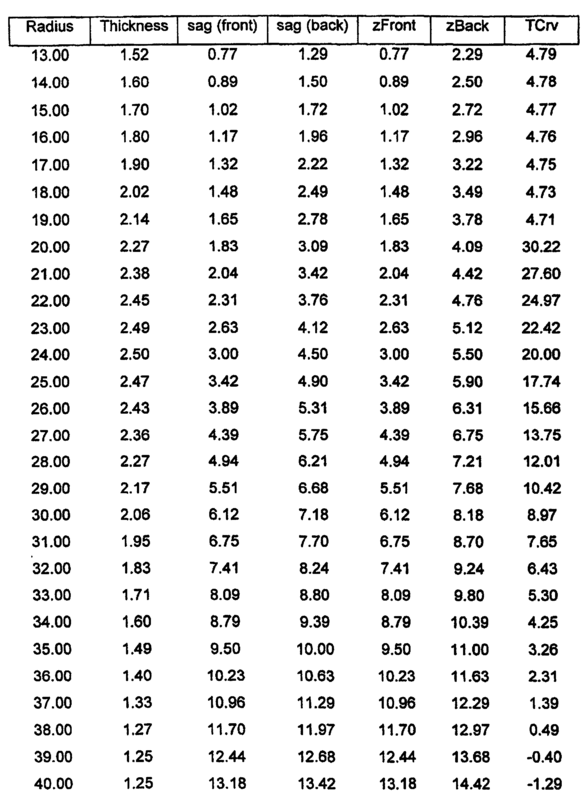 The resulting lens element is illustrated in Figure 25 and its surface characteristics are specified in Table 11. In this case, the temporal extension is piano, the lens has a thinner centre and the diameter of the optic zone is reduced. Example 14 was repeated utilising a front generating curve for the temporal extension of 8.00 D. A conic back surface of 8.0 D and a front surface of 11.0 D was used to define a lens of through power of +3.0 D and a generally piano temporal extension with a narrow edge thickness. The resulting lens is illustrated in Figure 26. The lens exhibits a discontinuity at the transition between the two design zones. The surface of Figure 26 has the characteristics specified in Table 12. Example 19 was repeated to produce a +1.0 D lens with an 8.0 D base temporal extension. The resulting lens is illustrated in Figure 27. 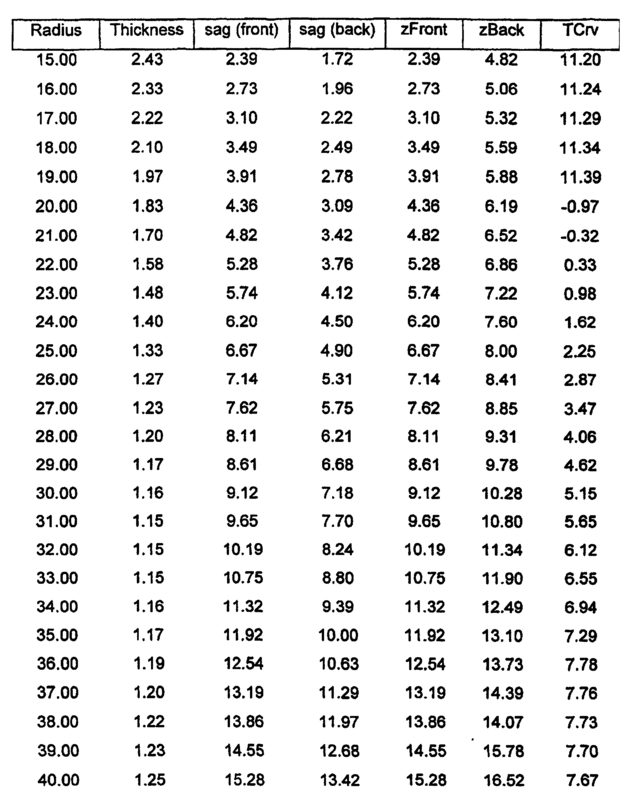 The surface of Figure 27 has the characteristics specified in Table 13. Example 19 was repeated to produce a -2.0 D lens with an 8.0 D base temporal extension. The resulting lens is illustrated in Figure 28. 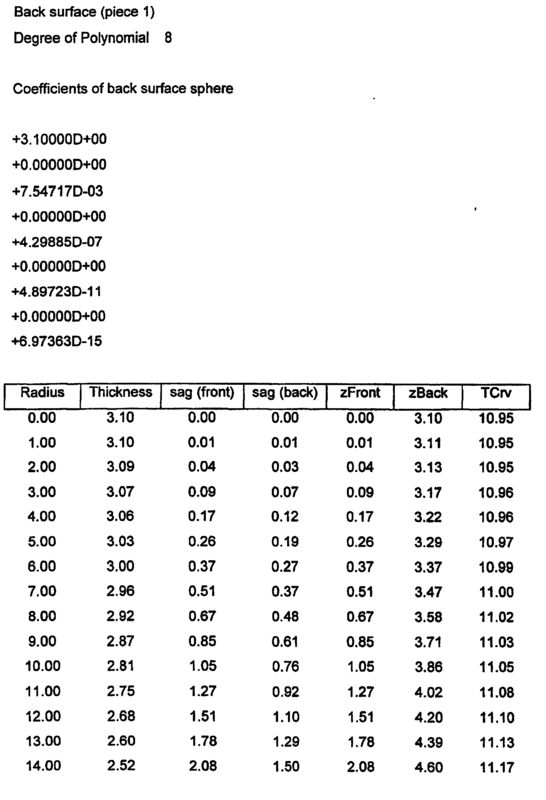 The surface of Figure 28 has the characteristics specified in Table 14. An optical lens element including a peripheral temporal zone was formed from a front +11 D base aspheric front surface and an +8 D base spherical back surface to provide a +3 D lens element. The curvature in the temporal region of the front surface is modified such that it corresponds to the curvature of the back surface, thus defining a piano temporal extension. The surfaces are designed utilising the modified mathematical formulae described above. Specifically, the lens element has a spherical or toric back surface whose curvature is chosen to conform with the wrap-around frame. The front surface of the lens element is an aspheric surface with three distinct zones. The central prescription region is developed to provide the desired through power and is optimised to minimise off-axis astigmatic and power errors. The front surface of the lens element at the periphery or temporal extension region is a sphere designed to give the lens in this region no through power (plano) as in a non-prescription sunlens. Between the inner and outer region the surface is developed from a polynomial spline whose purpose is to smoothly blend the central region with the periphery. Although the surface is designed as a full surface of rotation, only a portion of this surface is used in the actual frame. Accordingly the lens form may be manufactured in such a way that only part of the full surface of rotation is created prior to edging to fit the frame. 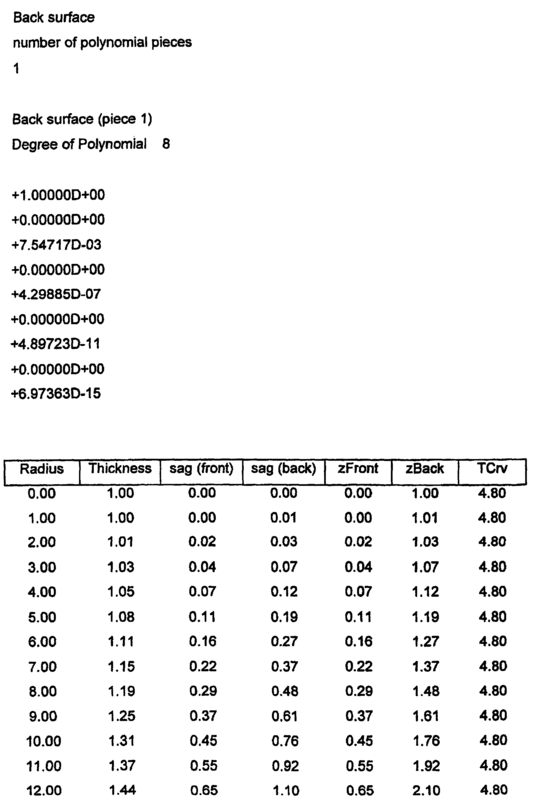 The surfaces have the characteristics specified in Table 15 below. The resulting lens element is illustrated schematically in Figure 29. Example 22 was repeated utilising a 5.0 D base aspherical front surface and an 8.0 D base spherical back surface to define a -3 D base lens element. 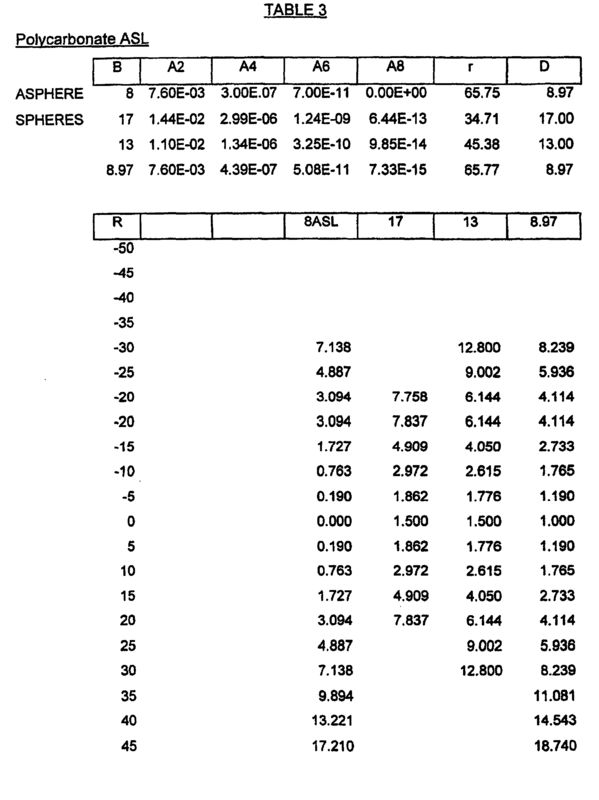 The surfaces have the characteristics specified in Table 16 below. The resulting lens element is illustrated in Figure 30. Finally, it is to be understood that various other modifications and/or alterations may be made without departing from the scope of the present invention as defined by the claims. wherein the front and/or back surface includes an aspheric component having non-circular main sections selected to at least partially adjust for off-axis astigmatic and mean power errors. A high curvature spectacle lens element according to Claim 1, wherein the front surface is an aspheric surface that includes appropriate aspheric coefficients to define the peripheral temporal zone. A high curvature spectacle lens element according to Claim 2, wherein the aspheric front surface exhibits line symmetry about the horizontal and/or vertical geometric axis thereof. A high curvature spectacle lens element according to Claim 2 or 3, wherein the aspheric coefficients defining the peripheral temporal zone exhibit line symmetry about a horizontal and/or vertical line intersecting the optical axis and/or line of direct sight, in use, thereof. A high curvature spectacle lens element according to Claim 4, wherein the aspheric surface corrections are in the horizontal direction. A high curvature spectacle lens element according to claim 1, further including a correction to avoid prismatic jump. A high curvature spectacle lens element according to Claim 1, wherein the lens provides correct Rx correction in the prescription (Rx) zone for a wearer in directions not greater than 50° off axis, in use, relative to the optical axis. A high curvature spectacle lens element according to Claim 1, wherein the lens provides a desired Rx correction in the prescription (Rx) zone for a wearer extending beyond 50° off axis and terminating in the peripheral temporal zone, that provides clear perception of objects in the peripheral area;of human vision and avoids prismatic jump from the prescription zone to the peripheral temporal zone. A high curvature spectacle lens element according to Claim 1, wherein the back surface includes a base curvature such that the patient's required prescription power, Rx, in the prescription zone is achieved; the back surface being further modified to complement the front surface selected. A high curvature spectacle lens element according to Claim 9, wherein the back surface includes a toric or spherical component selected to achieve the prescribed optical power and lens cylinder correction. A high curvature spectacle lens element according to Claim 10, wherein the back surface further includes an astigmatic error correction to compensate for errors induced by rotation about the vertical axis. A high curvature spectacle lens element according to Claim 11, wherein the surface is an aspheric toric surface and includes an adjustment to correct for on-axis astigmatic and/or mean power errors. the back surface is of appropriate curvature to provide the prescribed optical lens power and prescribed lens cylinder and including adjustments for astigmatic and mean power error correction to compensate for errors induced by rotation about the vertical axis. A high curvature spectacle lens element according to Claim 1, wherein the back surface includes a toric or spherical component. the back surface is modified to complement the front surface. A high curvature spectacle lens element according to Claim 1, and providing prescription correction in the zone in the range of about -6.0 D to +6.0 D with, about 0 to +3 cyl. A high curvature spectacle lens element according to Claim 16, wherein the peripheral temporal zone is a non-prescription zone. A high curvature spectacle lens element according to Claim 16, wherein the front surface of the lens element has a high curvature in the horizontal plane extending from nasal to temporal limits above 6.0 D, but the curvature in the vertical plane is 6.0 D or below. A high curvature spectacle lens element according to Claim 16, wherein the shape of the front or back surface in the region between the two zones is developed from a polynomial spline selected to avoid a prismatic jump from the Rx zone to the temporal zone. A high curvature spectacle lens element according to Claim 16, wherein the prescription zone extends beyond 50° off axis relative to the optical axis, when mounted in a frame, in use and terminates in a peripheral temporal zone. A unitary lens including a pair of high curvature spectacle lens elements according to any one of claims 16 to 20. A unitary lens according to Claim 21 wherein the lens provides correct Rx correction in the prescription (Rx) zone for a wearer not greater than 50° off axis, relative to the optical axis when mounted in a frame, in use. A unitary lens according to Claim 22, wherein the lens provides desired Rx correction in the prescription (Rx) zone for a wearer beyond 50° off axis when mounted in a frame in use and terminating in the peripheral temporal zone, that provides clear perception of objects in the peripheral area of human vision and avoids prismatic jump from the prescription zone to the peripheral temporal zone. A unitary lens according to Claim 23, wherein the prescription zone extends up to 80° off axis. the complementary back lens element includes a lens element of positive or negative power. modifying the representation of the lens surface to at least partially correct for errors induced by said rotation including astigmatic and mean power errors in the prescription zone and prismatic errors, and such that the front and/or back surface includes an aspheric component selected to at least partially adjust for off-axis astigmatic or mean power errors. a second mathematical or numerical representation of a transition section designed such that the prescription zone and peripheral temporal zone define a complete lens surface. A spectacle lens element according to any one of claims 1 to 20, which further includes a nasal accentuating region defined by reduced or opposite curvature of the lens. 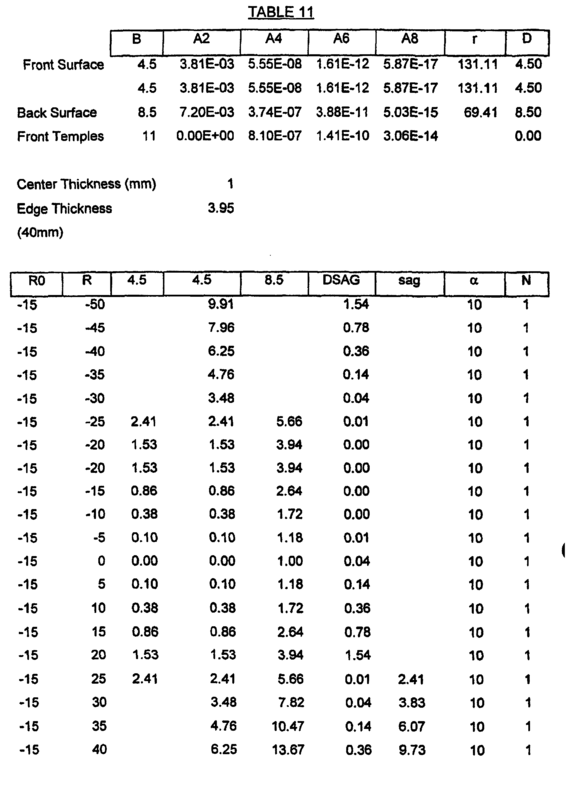 the front and/or back surface bearing a surface correction to at least partially adjust for errors induced by said rotation including astigmatic and mean power errors in the prescription zone, and a correction to at least partially adjust for prismatic errors, and wherein the front and/or back surface includes an aspheric component selected to at least partially adjust for off-axis astigmatic or mean power errors. Spectacles according to Claim 31, wherein the prescription zone extends beyond 50° off axis, relative to the optical axis. Spectacles according to claim 33, wherein the frame has a constant design curvature of between 8.0 D and 10.0 D.
AR018453A1 (en) 1998-06-04 2001-11-14 Sola Int Holdings Optical lens element series of optical lens elements, ophthalmic prescription article, method for manufacturing an optical lens element, and lens element ophthalmic prescription single vision. FR2692372B1 (en) 1992-06-12 1994-07-29 Buffet Alain Spectacle frame for filter glasses. Opponent name: SOLA INTERNATIONAL HOLDINGS, LTD. Owner name: CARL ZEISS VISION AUSTRALIA HOLDINGS LTD.